Mains Hook-Up Continental, enables a mains extension lead site plug to be connected to a continental 2 pin outlet. Accepts continental earth pin. Great product, very good price, very pleased. Great delivery and well packaged. Bought here as it was the cheapest and I have used them before with great success. Difficult to say what I love or what I hate as it is an inanimate object which I knew was 25mts long and for a specific use. Not a great deal to either love or hate but we are very pleased with it. Another successful transaction with Leisure Shop Direct - long may they continue. 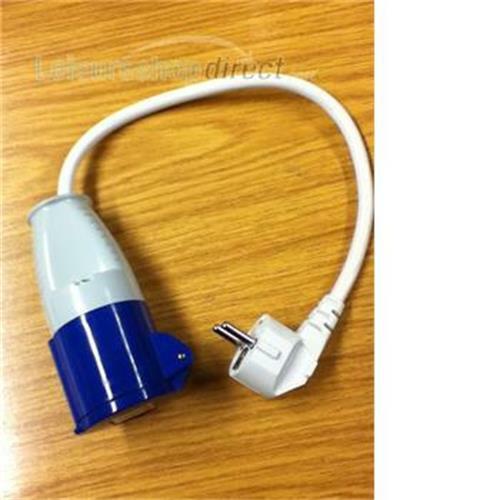 A must-have item for camp sites in europe and a no-hassle way of connecting your UK power cable to site power.